I value the challenge toward independence which my mother instilled in me. It is this motivation to empower the differently abled person to reach their greatest measure of independence which draws me to serve as a SCIL Board member. Blind since birth, I have received both support and discrimination. My professional career includes: religious service, teaching, administration, customer service and business ownership. The career which has brought me the most satisfaction and joy is mothering my daughter, Heather. If as a SCIL Board member I can encourage even a few persons to meet the challenges of life I will have been of service. As the newest board member, I feel privileged to bring years of experience as an advocate to this position. I have advocated for my two blind sons, now aged 35 and 40. During their formative years, I was teaching and coaching in high school. I quickly learned that not every child learns the same way, nor at the same time. I had high expectations of my students, but I also found ways to give them the opportunity to find success, through accommodations I thought might work, and through hard work on all of our parts. When I began teaching, the general conception of teaching was a cookie cutter approach, just like the industry of the time. I didn’t buy it then and still don’t. Kids with disabilities were treated by the system as “we know best,” and separated from the general population. This led me to buck the system. By joining and leading groups like NAPVI (National Association of Parents of the Visually Impaired), and (CAPVI), the California affiliate, my wife and I got involved in leadership roles to advocate for parents and their children. Through organizations like Joint Action Cmt. (JAC) and Low Incidence Disability Action Cmt. (LIDAC), I was able to lobby in Sacramento and Washington DC several times to bring about change for the improvement of education for these special populations. As I grew into administration (7-9 Assistant Principal, K-6 Principal, and K-8 Director of Special Education), I continued to fight the one size fits all philosophy that is pervasive in education and society in general. 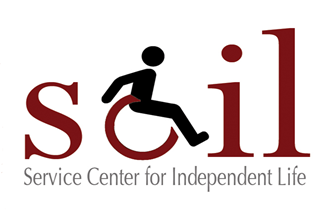 I hope I can bring my experiences and knowledge to SCIL and add to the fine advocacy and assistance this organization brings to those in need of support. Bruce Jacobson is the Facilities Maintenance Manager for the South Coast Air Quality Management District (SCAQMD) in Diamond Bar California. In this role, he manages all aspects of facilities maintenance to ensure the comfort and safety of the public and its employees in a 350,000 square foot facility including over 50 off-site air monitoring stations. As the Facilities Maintenance Manager, another critical role is to ensure the compliance of the American Disabilities Act (ADA) and to ensure the facilities are 100% accessible for all persons with disabilities. Bruce is no stranger to the needs and requirements of persons with disabilities. His career spans 13 years in commercial and residential construction and 29 years in facilities maintenance for city and government facilities. During his career, he has experienced firsthand the needs of the disabled community and all the changes of ADA requirements over the years. Before joining SCIL, he was working for the City of Pomona where he was advocating for play equipment in the local parks to become not just ADA compliant, but handicap accessible as well. The design vision was to incorporate a series of accessible ramps on the equipment where in kids with or without disabilities can play together. The Pomona City Council supported this vision and made it a reality at Ganesha Park. In 2007 Bruce was asked by Dr. Lee Nattress to join the Board of Directors for SCIL and he accepted. Initially the position was member at large, and then he was asked by Dr. Lee Nattress to accept the position of Vice Chair. In February 2014 the Chairperson was asked to fill the vacant position of the Executive Director, he accepted and was voted in by the board to the position of Executive Director. This left the position of Chairperson vacant. Bruce was asked to take on the duties as the Chairperson which he accepted with pleasure. The opportunity to be a part of such an honorable and dedicated group of people has been very gratifying. During his time with SCIL, he has also been involved with other non-profit organizations like the Relay for Life in Yorba Linda, Disabilities Sports Festival Cal State San Bernardino, and working with staff and MT SAC to start the spring Disabilities First Sports Festival. My involvement and passion to work with and serve the disability community stems from a very personal experience of being the sibling and conservator for my youngest sister who has a disability. As her conservator and advocate, I realized the need for broader involvement and a greater impact. There are great health disparities within the disability community and my work within health education, low literacy and rehabilitation counseling allows me to utilize my knowledge to serve a highly underserved community. Serving on the SCIL board excites and motivates me as the opportunities for change and growth are endless!